Ardmore, Tenn., Sept 26, 2005 -- Audio Enhancers announced today the introduction of new AX10 and AX12 speaker enclosures designed for and approved by Alpine Electronics of America, Inc. The enclosures are designed with Alpine’s high-end, mobile electronics niche in mind, taking bass performance to an entirely new level. Audio Enhancers has built its reputation and success on innovative engineering and design. The company’s new slot-ported, performance-engineered enclosures were custom-built to house Alpine’s Type-X subwoofers. Within the new enclosure, the subwoofer boasts powerfully clear and smooth sound. Audio Enhancers met Alpine’s challenge by designing and producing the AX10 for the Alpine 10” SWX-1042D and AX12 for the 12” SWX-1242D. These enclosures offer the sound quality and power handling capabilities of sealed enclosures with the kind of SPL output only ported enclosures can provide. The new AX10 and AX12 enclosures boast 1.5” MDF face plates and an all 0.75” MDF construction, tuned slot ports, platinum terminal cups and latex-backed carpet. The new AX10 and AX12 enclosures will retail at $159.99 and $169.99 respectively, and will be offered by all authorized Audio Enhancers retailers. 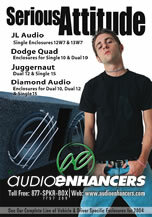 Consumers and retailers are invitied to visit the company’s web site at www.audioenhancers.com. 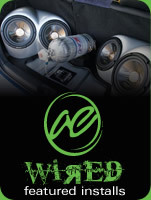 For more information about Alpine’s Type X subwoofers, visit www.alpine-usa.com. Audio Enhancers, ranked as one of the top 50 Tennessee companies with the fastest revenue growth in 2004 according to Business Tennessee magazine, is an audio enclosure provider with a reputation for being the technology leader in the industry. During the past 23 years, Audio Enhancers has supplied car speaker cabinets to over 750 dealers, seven distributors and numerous OEM accounts. 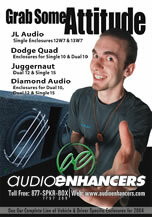 Audio Enhancers, based in Ardmore, Tennessee, is an international provider of a wide selection of audio speaker cabinets, boasting the world’s largest selection of vehicle-specific and driver-specific models. Offering a 100% product satisfaction guarantee and a superior level of personal service, the company is a veteran in the industry, serving clients since 1982. Audio Enhancers is a member of the Mobile Electronics Competition Association (MECA) and the Mobile Enhancement Retailers Association (MERA).